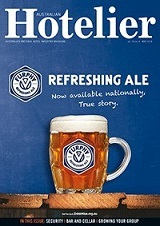 Australian Hotelier is the monthly magazine for the nation’s pubs and supplier partners. For more than 30 years, it has delivered industry insights, product news, category analysis and advice for licensees. The digital arm of Australian Hotelier is www.theshout.com.au/australian-hotelier, a micro-site dedicated to the pub sector hosted on Australia’s leading trade drinks website The Shout. A fortnightly Australian Hotelier e-newsletter containing the latest industry news and advice from suppliers is read by more than 3,500 publicans. Every quarter, Australian Hotelier contains its extended Pub Dining section, aimed at publicans and pub chefs, and reflecting the growing significance of foodservice as a revenue stream for publicans and as a draw card for patrons. Aimed at publicans and pub chefs, the features within Pub Dining are tailored to hotel-specific foodservice topics. As a value-added benefit, Australian Hotelier also includes National Liquor News, the monthly publication for drinks retailers.